It’s never too early to start getting ready for the first fishing trip of the New Year. That means taking stock of your gear, including your net. Since hooking the fish won’t mean much unless you can also land the fish it could be argued that the net is your most important piece of tackle. Sifting through the hundreds of different nets available today, however, can be a daunting task. So we’re here to help you cut to the chase. Below are the 10 best fishing nets for 2019. Nobody wants to be overwhelmed by their tackle as they’re making their way through the woods to their favorite fishing hole. That’s one reason we have collapsible fishing nets today like the Fiblink Folding Aluminum Fishing Net. Fiblink folding fishing nets fold down to about 1/3 their full size which lets you sling and forget about it. The handle is extendable for when you’re fishing off the boat in Minnesota and collapsible for when you’re landing trout in a Vermont stream. The mesh is fashioned from waterproof nylon with a non-hydrophilic coating that prevents it from getting waterlogged. The mesh structure is small and strong and unlikely to tangle regardless of the size of the fish. The aluminum used here is flexible but will stand up to being opened and closed repeatedly during the course of the year. Suitable for fresh or saltwater you can take it along with the confidence to the stream or pond. This also makes a great gift for fishermen in your life. 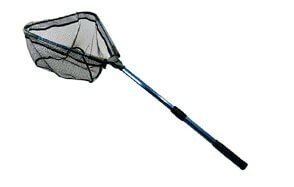 A great all-purpose net that can be easily slung. Nylon mesh is less stressful on fish. Can be used in the boat or on the river bank. Make sure you rotate to lock the handle. KastKing doesn’t mess around with their foldable landing net. 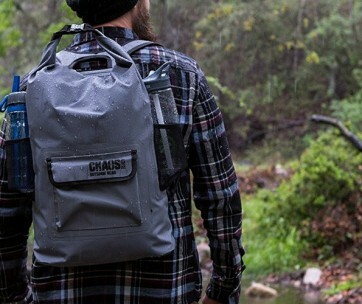 It’s crafted from industrial strength graphite with stainless steel and aluminum components. Although the KastKing weighs less than 2 pounds it’s remarkably strong and won’t succumb to the thrashings of the biggest fish. The handle is fully retractable and the flat bottom provides an ideal platform for measuring fish when engaging in catch and release. 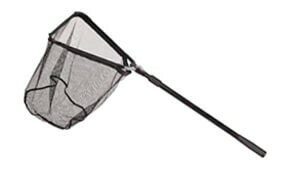 The KastKing Folding Landing Net is beautifully balanced and folds down in seconds for storage in the handsome carrying sack. Whether you’re out for a day in the boat or relaxing along the banks of your favorite trout stream KastKing folding fishing nets are there when you need them. You definitely want this along as one of your large fishing nets. Don’t forget to wear your favorite fishing watch and enjoy a day on the water. Flat bottom net is fish-friendly and ideal for measuring. Extendable handle means it’s right at home on the boat. Folds down in a matter of seconds. Water-repellent nylon mesh won’t succumb to prolonged dunkings. Not great for smaller fish. Frabill is well known for their high-quality, affordable fishing nets. Their Folding Net with Telescoping Handle is large enough to take along on the boat and yet it folds down to almost nothing for when you need to haul it down the path for a while. The net collapses at the push of a button and the handle can be extended from 20 to 40 inches just as quickly and easily. The mesh is 14 inches deep and has a flat bottom so you can regard your fish thoroughly and then release it knowing you haven’t done it irreparable harm. While marketing for the net emphasizes it’s compatibility with canoe and kayak fishing the truth is you can use this versatile, well-constructed net just about anywhere and for everything except some of the smaller species. Be sure to also check out our list of the best fishing shirts for more great items like this. Telescoping handle for open water fishing. Collapses with the push of a button. Durable but gentle tangle-free mesh. As affordable as it is versatile. Folds up fast and tidy and can be easily slung. Can handle just about any species up to 20 inches. Not the heaviest of Frabill nets. Wakeman Fishing Net is a handsome, well-built landing net with a wide mouth and rubberized mesh that isn’t going to do unnecessary damage to your catch. It’s got a nice flat bottom so you can see and measure your catch before releasing and the handle slides forward to minimize any hassle carrying and storing the net. The mesh composition and design discourages hook snags and allows the fish to emerge virtually unscathed from the encounter. The handle is strong and won’t give way when you’ve got that 7 pounder on the line. One of the better large fishing nets for medium and large sized fish whether freshwater or saltwater. 20 inch net opening with 17 inch depth. Flat bottom mesh allows for safe viewing. Great for catch and release fishing. The aluminum handle is robust and dependable. 35 inch handle is great for boat fishing. The rubberized mesh won’t abuse your catch. Net not fine enough for some smaller fish. The Plusinno collapsible fishing net is a beauty that will cradle your catch rather than punish them and let you land even large fish with a great deal of ease and confidence. The handle is one of the most well-considered and comfortable we’ve encountered. It’s also telescopic so you can use it on sea or river bank. The waterproof nylon mesh has a non-absorbent coating that prevents it from rotting or playing host to harmful bacteria. And the whole thing breaks down in seconds so you can sling it and go, or attach it to the specially designed belt clip. The mesh is knotless which means not only will it be gentle on your catch it will also prevent fish hooks from getting tangled. Our handy guide to the best fishing shoes features more great products like this. Folds up quickly and easily. Knotless mesh construction is easy on fish. Waterproof nylon won’t rot or attract bacteria. It folds down into a manageable size with little fuss. The knotless mesh design is ideal for catch and release. Great for pond or open water fishing. Sometimes you need to get the net out to the catch before it gets away but you’re caught having to manually work the handle extension system. Not so with the Ego S2 Slider Landing Net. The S2 utilizes a patented design that allows you to automatically extend the net 100% by simply pushing a button and pulling on the handle. As you pull the handle toward you the net projects outward toward your catch. In seconds you’re under it and pulling it boatside. Another great aspect of the S2 is that if you drop it overboard it isn’t going to make a beeline for the bottom. For those looking for fly fishing nets, the handle screws off and the standard mesh can be swapped out for something shallower. One of the best fishing nets around, but you’ll pay for it. All major components are interchangeable. Won’t sink if dropped in the water. Large, deep bag with PVC-coated mesh. Floats like a charm when dropped in the water. 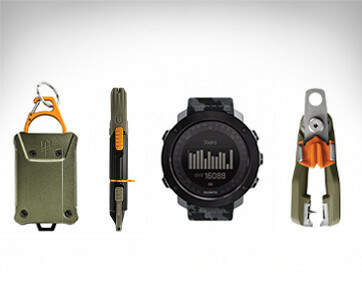 Use it on the river, pond or the open water. The handle extension mechanism thrusts the net out to grab your catch. No-slip handle provides a firm grip every time. The handle of the Frabill Power Stow Net may not be ideal for open water fishing but it would do in a pinch. Where it really shines is when you’re going after large freshwater fish. In that case you’ll find the handle pleasantly strong (even though it’s lightweight), the knotless mesh forgiving on the fish, (which is crucial for catch and release) and you’ll learn quickly that the mesh won’t fail even when landing large aggressive species. The sliding handle does allow for some flexibility and the net folds down quickly to the very manageable size of 8 x 26 inches. It’s not quite as versatile as some of our other nets but for medium to large size fish it’s a winner. Love fishing? Check out our review of the best fishing backpacks for our top picks. Folds down quickly and easily. Ideal for large freshwater fish. One of the toughest mid-sized nets you’ll find. Mesh design doesn’t punish fish so it’s great for catch and release. Not a collapsible fishing net. The MelkTemm Foldable Landing Net has a little bit of everything going for it. Which is what makes it our Best Value. The mesh is fish-friendly yet strong, the flat bottom makes it ideal for catch and release, the entire net breaks down quickly and effectively and the handle lets you extend the net out to nearly 39 inches. On top of that the net is fashioned from high strength yet low weight industrial grade aluminum, has a nice wide mouth so you won’t miss your catch and is suitable for river, lake or open water fishing. The fact that it’s so affordable makes one wonder why so many other nets need to cost as much as they do. Make sure you also check our guide to the best fishing vests. Flat bottom mesh is easy on fish. The hand grip is full, sure and comfortable. It’s long enough for the boat but versatile enough for the river. The mesh design is fish-friendly. Incredibly the whole thing weighs less than a pound. Would like to see the handle contract a bit more. While no one will accuse the ForEverlast Generation 2 Net of being the most versatile on planet earth it is nonetheless an outstanding net for wade fisherman. Compact, light and strong it features a no snag net that’s nice and deep, a flat bottom that allows you to keep the fish secured while measuring and knotless construction that’s not going to tear into the gills and scales of your catch. It’s a bit of a one trick pony to be sure but at the same time it really nails that trick. If you’re a wader you couldn’t ask for a better landing net. Find more great products like this by checking out our guide to the best sunglasses for fishing. Molded handle provides a nice secure grip. Wide enough for most medium sized fish. One of the few nets that actually floats. Won’t be much use on the open water. The final entry on our list of best fishing nets is the South Bend 24 inch Deep Landing Net. This is a basic, all-purpose freshwater net that’s lightweight and durable. The handle is strong and grip simple and secure. With a mesh that is 24 inches deep and a handle that is designed to stand up to maximum stress the South Bend 24 inch is a tough, no-nonsense net that designed to help you snag even large freshwater fighters before they shake themselves loose. Great for waders, fly fishers and for days in the rowboat on your favorite pond. It’s uncomplicated, unpretentious fishing tackle that will appeal to purists and newcomers alike. If you need serious fishing equipment, make sure you check our guide to the best underwater fishing lights. Ideal for fish under 10 pounds. Very light yet very tough and durable. The mesh is deep enough to accommodate fairly large fish. Great to have along on the rowboat, canoe or kayak. Not for catch and release. Brand - While we’ll always give a good long look to industry stalwarts like Frabill we try to keep an open mind. Our only real desire is to find the best nets on the market regardless of who makes them. True, they often wind up being recognizable brand names, but not always. Reviews - We’re asked a lot about how much weight we give to reviews, especially customer reviews. And the answer is: not much. You wouldn’t decide whether a movie was good or bad based what somebody else said. You’d want to see it for yourself. Same here. We’ll take what others say into account but it needs to deliver for us or it doesn’t make our list. Design - Fishing nets aren’t furniture. There isn’t a lot you can do design wise to set one apart from the other since, with finishing nets, form very much follows function. As such you want something that’s sturdy, fairly light but not too light, has a durable mesh and doesn’t cost an arm and a leg. If it also happens to look great that’s pretty much gravy. A fishing net is a crucial piece of equipment for any angler. Picking the right one will make your day on the boat, on the pier or on the river bank more successful and enjoyable. Here are some of the things you’ll want to look for in a good fishing net. Handle - Handles tend to fail more frequently than any other component of the net. That’s because a lot of companies fabricate their handles from cheap, low-grade aluminum. As a result when you land a big, unhappy fish the aluminum handle winds up failing. Make sure any aluminum handle is thick and durable. Also, consider wood or graphite over aluminum. Length - Short handle nets are better for stream fishing, long handles for boat fishing; where you don’t want to be leaning too far out over the open water to land your fish. That said the shorter the handle the less likely it is to fail. Net size - Net size will largely be determined by the type of fish you’re after. Handles on carp nets can be up to 6 feet long with net heads of around 42 inches. 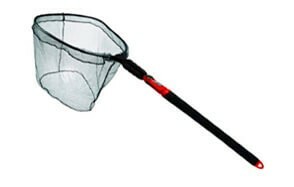 Trout nets by comparison are typically short with large openings and stumpy handles. For bass you might want something with a longer handle and a net up to 2 feet at its widest (think triangular net). Net shape - Nets come in several standard shapes: oval, circular, teardrop and flat-bottom. 10 to 12 inch diameter circular and teardrop shaped nets are good for shallow water and smaller fish. Flat-bottomed nets are used a lot for catch and release, because they give you a good view of the fish. They're also good for larger fish. Material of the mesh - Most fishing nets utilize one of 3 different materials: nylon, nylon coated cord or rubber. Nylon is probably the most popular because it’s inexpensive, versatile and reasonably durable. Coated nylon is easy on gills and scales. Rubber or rubberized mesh is similarly easy on the fish and is used by those engaged in catch and release. Fixed frame - Fix frame nets come in a variety of shapes and sizes and while they’re bulkier than folding fishing nets they’re also far more robust and they’re going to be rock steady when you’re trying to land a live one. Folding - The folding net is designed to save space and make it easier for you to lug your gear to your favorite fishing hole. Some fold in half while others are designed to fold down onto themselves in a sort of helix fashion. Folding nets save you valuable storage space and make trudging to the fishing spot easier. Fly fishing - The fly fishing net needs to be able to withstand long hours of wading and dunking while also being able to stand up to an aggressive and unhappy bull trout. Anyone engaging in catch and release is going to have to make sure their fly/trout net mesh is forgiving in order to give the fish a fighting chance at survival. Q: What is a Fishing Net? A: When sport fishermen are ready to make the final few turns of the reel and land that prize catch they can’t just drop it onto the ground and step on it. They need a way to bring order to the chaos of the catch and the net allows them to do that. When the fish is in the net it is safely under control and the angler can go about removing the hook and either dropping it in the tub or returning it to the water. Q: How do fishing nets work? A: As we said the primary purpose of the fishing net is to impose order on the chaos inherent in landing a fish. 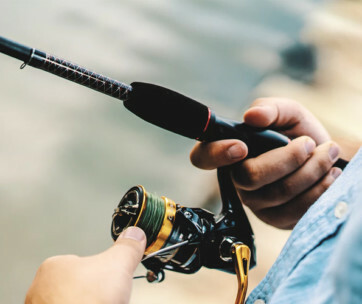 The net allows the angler to put the finishing touches on the catch quicker and avoid the possibility that the catch could get away at the last minute. Netting the fish is also the preferred way to operate when engaging in catch and release as it shortens the fight and, if you are using the proper type of mesh, there is less all around stress on the fish. Q: Can nets be replaced? Q: Are fishing nets safe for fish? A: Because of the rise of “catch and release” many of today’s best fishing nets are relatively safe for fish. If you have a net with a knotted mesh you’ll want to minimize time in the net if you plan on releasing the fish. The best type of mesh for the fish is rubber or rubberized. Much less punitive than a standard net, the rubber net won’t tear at gills and scales as the fish thrash about.